CLICK HERE for photos from The Dedication of the Katherine Esterly Organ, February 19, 2017. 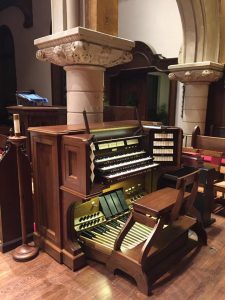 The new pipe organ for the Episcopal Church of Saints Andrew & Matthew (SsAM) in Wilmington, Delaware is Quimby Pipe Organs’ Opus 72, and is comprised of 45 ranks divided into four manual divisions and pedal, playable from a new three manual and pedal console. The new organ replaces a two-manual Möller, Opus 7114, which was completed in 1948. The Episcopal Church of Saints Andrew & Matthew is the successful result of the combination of two established Episcopal congregations in Wilmington, in 1995. Since that time, the Episcopal Cathedral of St. John in Wilmington was closed, and many congregants moved to Sts. Andrew & Matthew. Because of this, as a symbolic gesture of bringing many disparate parts into a unified whole, ranks of pipes from all three church organs have been incorporated into the new Quimby organ. In addition to the St. Andrew Möller, pipes were used from both the St. Matthew 1956 Möller, Opus 8832, and the 1920 Möller, Opus 2992 (rebuilt by Möller in 1952 and 1967) from the Cathedral Church of St. John. Some of the pipes in the St. Andrew Möller were retained from the church’s former 1907 C.S. Haskell organ, and have also been reused in the new organ. The console, built by Jim Schmidt, is a departure from our standard practice, and was modeled on the elegantly compact and attractive three manual console built by Aeolian for their 1930 three-manual and pedal instrument at Memorial Presbyterian Church in St. Louis, and features tilting stop tablets on angled jambs. The organ was completion in January 2017 with Service of Dedication (featuring David Christopher and the SsAM Choirs) on Sunday 19 February 2017 at 4:00 p.m. and the Dedicatory Recital (given by Ken Cowan) on Saturday, 25 February 2017 at 7:00 p.m. Written by Daniel T. Hancock, President, Quimby Pipe Organs, Inc.